MIAMI — A FlyJamaica Boeing 757-200 has overrun the runway at Georgetown International Airport, sustaining significant damage to its fuselage and landing gear and injuring two passengers. The aircraft, registered N524AT, overran Runway 06 coming to a complete stop on soft sand, damaging its landing gear, engines, and fuselage. Reportedly, the 757 experienced some technical difficulties about 45 minutes after departing Georgetown. The flight crew decided to head back to the airport, where it overran the runway after touching down. Flight OJ256 to Toronto was carrying 118 passengers and crew onboard. Eyewitness reports state that the 757 crashed into the airport’s fence and came to a full stop when hitting a large pile of sand after the runway. The airline has confirmed via a public statement that FlyJamaica flight OJ256 “returned to Georgetown with a technical problem and has suffered an accident on landing.”“At this time, we believe that all 118 passengers and 8 crewmembers are safe. We are providing local assistance and will release further information as soon as it is available,” ended the statement. Safety slides were deployed and all passengers were evacuated.This would be the third incident in less than one week where a Boeing aircraft is involved. The plane was performing flight GG4854 from Chicago-O’Hare, coming to a full stop and sustaining significant damage to its engines and lower fuselage. No injuries were been registered. And on October 30, a brand-new Lion Air Boeing 737 MAX 8 (PK-LQP • MSN 43000 / LN 7058) crashed shortly after takeoff from Jakarta, Indonesia, killing all 188 passengers onboard. FlyJamaica currently operates a fleet of only two airplanes, a Boeing 767-300(ER) and the damaged 757. The Jamaican carrier was given its Air Operators Certificate (AOC) in 2012, also obtaining rights to operate to the United States. The airline flies regularly to New York (JFK) and Guyana (GEO) from its base in Kingston (KIN). The damaged Boeing 757 was delivered to American Trans Air in 1999, then flying for a myriad of carriers around the world, including VIM Airlines, Aurela, Thomas Cook, Flycraft, and Wings Aviation. FlyJamaica also operates from Guyana to New York and Toronto (YYZ). The FAA has issued an Emergency Airworthiness Directive that directs the owners of all Boeing 737 Max aircraft to amend their operating manuals, to avoid a control problem like the one that apparently caused the fatal crash of a Max 8 last week. “Possible erroneous angle-of-attack inputs on Boeing 737 Max aircraft … can potentially make the horizontal stabilizers repeatedly pitch the nose of the airplane downward, making the aircraft difficult to control," the FAA says in an emergency AD dated Nov. 7. The airplanes are not grounded, and the owners have three days to comply with the AD, which requires a revision to the airplane flight manual. MIAMI — United Airlines has become America’s first carrier to take delivery of the largest variant of the Boeing 787 Dreamliner—the dash ten—also gaining the title as the only airline in the world to operate all three variants: the 787-8, -9, and -10. This is the first of 14 Boeing 787-10s that will be joining United’s fleet in the next few years. United is the third airline, after Singapore Airlines and Etihad Airways, to take delivery of the 787-10. The new plane, bearing the registration N14001 (MSN 40936 • LN 731) is expected to enter service on January 7, 2019, linking Los Angeles (LAX) and Newark (EWR). The 787-10 was handed over to United at Boeing’s Charleston delivery center today in a quiet ceremony. However, the plane is not leaving Charleston until tomorrow, November 6. Boeing’s SVP of Commercial Sales and Marketing, said during the announcement that Boeing is honored that United has placed its trust in the 787 family, “carefully optimizing their network with all three Dreamliner models. ” The new, longer variant is, in fact, 18 feet longer than the 787-9, housing more passengers and cargo. 787-10: Cabin, IFE Upgrades: The plane comes with 44 Polaris business class seats, 21 Premium Plus seats, 54 Economy Plus seats and 199 Economy Class seats. United & Boeing: Strengthening 787 Relationship: As of October, United operates a fleet of 12 Boeing 787-8s and 25 787-9s. In October, it placed an order for nine additional 787-9s and announced the routes where its first 787-10s will be flying to. The opening 787-10s will begin its operational life at United flying transcontinental services between Newark, Los Angeles, and San Francisco. Later on, the plane will be deployed on some European destinations from United’s hub in Newark. Adding the 787-10 onto each route will increase the seat offering to more than 7,200 seats per day, 1,000 of which are now premium seating. The -10 will appear on the Newark-Los Angeles rotation twice in a day, according to United. The carrier has had a remarkable relationship with the Dreamliner, becoming the airplane’s North American launch customer for the original version, the 787-8. United debuted its the aircraft in August 2012 and began flying passengers on November 4, 2012. The airline also became the first operator of the 787-9 in the United States back in September 2014, when it took delivery of the first aircraft (N38950). And to keep up the positive trend, it has just become the first US operator of the largest variant in the Dreamliner family, the 787-10. Stay tuned for interior photos, soon to be revealed by the carrier in an official presentation. A Boeing 747 Sky Lease Cargo flight skidded off the end of runway 14/32 at Halifax Stanfield International Airport, after a flight from Chicago on Wednesday morning. Nathan Coleman of Canada’s weathernetwork.com captured photos and video of the jumbo jet, up to its lower cowlings in the dirt on the left side and resting on the fuselage. The airport was shut down shortly after 5:00 am local time but some flights have resumed. Four people, all members of the crew were taken to the hospital. There does not appear to have been anyone else aboard the flight which was headed to China after the stop at Halifax, an airport spokeswoman said. Aviation Herald also obtained photographs at the scene. The Canada Transport Safety Board says it will investigate. This is the third Boeing 747 and the second cargo flight to come to an unceremonious stop in the past month. On October 8th, a Thai Airways 747-400 passenger flight with 115 people on board skidded off the runway after landing in heavy rain. A photo of the plane appears remarkably similar to the Sky Lease 747 in Halifax. Local media reported there were no injuries to anyone on the flight which had originated in Guangzhou. Three and a half weeks ago, a Polar Air Cargo, registration N451PA, with five people on board skidded off the runway 27 at Cincinnati Northern Kentucky International Airport. Pilots of the flight from Anchorage had performed a go-around and were on the second landing attempt. The National Transportation Safety Board is investigating that accident. PEORIA — A Chicago man who used a United Airlines computer at Peoria’s airport to steal meal vouchers was sentenced to 33 months in federal prison this week. Ollantay Corujo, 37, also must pay $559,345.67 to United Airlines to account for the loss, ordered Chief U.S. District Judge James Shadid on Thursday. He had pleaded guilty in July to several counts of bank fraud. He was a former United employee who was fired in late 2016. However, he kept his uniform and his old ID badge. Using those, federal court records stated, he would go to various airports around the nation, access a computer terminal and print out tens of thousands of meal vouchers. While each voucher was worth around $20 to $30 — they are normally given to travelers whose flight was late or if they were “bumped” off a flight to pay for food or for a room — they were the functional equivalent of cash, according to court records. Corujo would then “redeem” those vouchers through a food truck company that he owned, causing cash to flow to him without him ever buying or using the vouchers as intended. Corujo had performed similar thefts in Boston, Miami, Milwaukee, Harrisburg, Pa., and once previously in Peoria, according to federal records, totaling more than $555,000. Because such vouchers usually expire within 48 hours, court documents suggest that he’d spend them immediately with the company he operated. He was caught here in Peoria by employees at Gen. Wayne A. Downing Peoria International Airport. 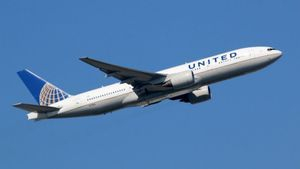 According to a report filed at the Peoria County Sheriff’s Office, a deputy was called to the airport after airport security noticed an unauthorized man using one of the computer terminals at the United Airlines ticket counter. Corujo had flown in the night before and walked from the Byerly Aviation hangar to the main terminal. He was seen going behind the counter and using a computer. When approached by security, he said he was with United and was there to work on its computers. When Carli McConaughy pulled on the big control column in the middle of the helicopter she was flying in over Honolulu last week, she had no idea what she was doing but she likely saved her own life and those of her fiancé and the unconscious pilot beside her. McConaughy, 35, and her newly betrothed Adam Barnett, 31, both of Joliet, Illinois, took a sightseeing flight as part of their Hawaiian vacation after getting engaged on Oahu. They told the Chicago Tribune that as they skirted the waterfront at 1,000 feet, the pilot suddenly slumped over and the Robinson R-44 dove for the water. Barnett yelled from the back seat for her to “pull it up” while gesturing to the cyclic control between their seats and McConaughy, who had no flight experience, gave it a mighty tug. It arrested the descent enough that all survived the impact with relatively minor injuries. “We hit the water hard,” she said. “I just think it was the best way we could have crashed. We all survived.” The aircraft crashed in waist-deep water and Burnett was able to pull his future bride and the 57-year-old pilot out. They were taken to shore by first responders on jet skis. All had broken bones but no life-threatening injuries. The company that operated the helicopter told the Honolulu Star Advertiser the pilot suffered a medical issue on the flight but did not elaborate. A Lion Air Boeing 737 crashed into the Java Sea just after takeoff early Monday and the fate of the 189 people aboard remains unknown. 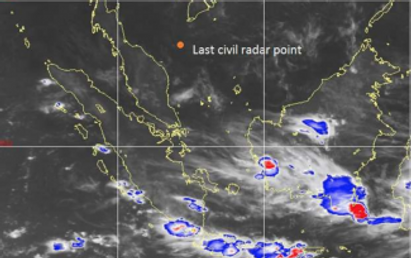 The aircraft was en route to Pangkal Pinang island, about 400 miles north, when it went down just off the coast. It crashed into the water 13 minutes after takeoff following an erratic climb. “We are waiting for a miracle of God,” Nugroho Budi Wiryanto, deputy operations chief at the national search-and-rescue agency, told news agencies. At least 300 rescuers were deployed to the crash site, where they were recovering crash debris but, as of early Monday east coast time, no survivors. Controllers lost radio contact with Lion Air JT-610 before it descended 3000 feet to impact the sea off the coast of Jakarta. FlightAware and Flightradar24 showed the aircraft, a new Boeing 737 Max 8 purchased earlier this year, climbing erratically, never reaching its assigned altitude. Lion Air was established in 1999 and is Indonesia’s largest budget airline. AVweb will update this story as more information becomes available. Among the passengers were 20 Indonesian government officials. There were no early reports of casualties but small wreckage, including seats, has been found floating on the surface. The aircraft left Jakarta at 6:21 a.m. Monday morning and the aircraft crashed about 13 minutes later. Winds were calm and skies were mostly clear at the time of the crash. International airport. Utilising the latest biometric technology - a mix of facial and iris recognition - Emirates passengers can soon check in for their flight, complete immigration formalities, enter the Emirates Lounge, and board their flights, simply by strolling through the airport. The latest biometric equipment has already been installed at Emirates Terminal 3, Dubai International airport. This equipment can be found at select check-in counters, at the Emirates Lounge in Concourse B for premium passengers, and at select boarding gates. Areas where biometric equipment are installed will be clearly marked. Trials for the Smart Tunnel, a project by the General Directorate of Residence and Foreigners Affairs in Dubai in collaboration with Emirates, was launched earlier this month. It is a world-first for passport control, where passengers simply walk through a tunnel and are “cleared” by immigration authorities without human intervention or the need for a physical passport stamp. Once its internal tests are completed, Emirates will shortly launch trials for biometric processing at the other key customer points at the airport – check-in, lounge, and boarding gate – and subsequently at transit counters/gates, and for its chauffeur drive services. All biometric data will be stored with GDRFA, and customers invited to participate in the trials will be asked for their consent. SAN FRANCISCO — United Airlines’ San Francisco (SFO) Maintenance Center is celebrating its 70th anniversary this year. The vast 125-acre facility consists of 2.9 million square feet of working space ranging from airframe hangars to component and engine overhaul shops. Opened in 1948, United Airlines San Francisco Maintenance Base is celebrating 70th anniversary this year. This celebration of U.S. Navy’s night is a highlight event for many San Francisco Bay Area residents every Columbus Day weekend. United hosts many air show performers at its Maintenance Base during San Francisco Fleet Week, including the beautiful Lockheed T-33 Shooting Star “Ace Maker II” with pilot Gregory “Wired” Colyer. United uses this opportunity to showcase the facility to their 14,000 local employees, their families and guests. United President Scott Kirby described San Francisco as “a crown jewel for United Airlines.” He continued, “it is important not only to United Airlines, but it is also important to the economy here in San Francisco.” The airlines’ worldwide connectivity is “critical to the underpinnings and supports (everything) that happens in Silicon Valley and San Francisco”. One of the highlights was the appearance of the Chix Fix team. This all-women technician team participated in the 2018 Aerospace Maintenance Competition (AMC). This competition can be best described as an aircraft mechanic’s decathlon. Over a two day period, teams compete in maintenance skill challenges in 28 categories such as avionics, hydraulics, and engine troubleshooting. Each event is timed at 15 minutes and the team that finishes in the shortest time with least penalties is declared the winner. United’s history-making all-women mechanic competition team “Chix Fix” poses in front of the enormous GE90-115B engine used on the Boeing 777-300ER. To make the contest fair, each team competes against their peers appropriate to their segment of the aerospace industry: commercial airlines, general aviation, military, repair and manufacturing, school, and space. The six-technician (five plus one alternate) Chix Fix team hailed from five stations around the United system. Each technician was personally selected by their supervisor. They did not know each other prior to joining the team, so they trained together for about five weeks before the competition. Aviation Mechanics Competition (AMC) Airbus Category II/III Certification Test winner Janelle Bendt (left) explains her experience during the event while team coach Bonnie Turner (right) looks on. United Technical Operations perform many services at the SFO Maintenance Center. One of which is the detailed maintenance inspection check. Inside one of many aircraft bays in the vast hangar complex, we got a close look at a Boeing 737-900ER undergoing a C-Check. United 737-900ER N69847 is seen undergoing C-Check inside a hangar bay at the airline’s SFO Maintenance Base. This check is scheduled every 18 months and it takes from 10 to 12 days to complete. During this arduous inspection, the aircraft is surrounded by scaffoldings, with most access panels opened and control surfaces deployed. Inside aircraft number 0847, Maintenance Supervisor Scott Tran showed some of the activities performed during a C-Check. The forward galley has been removed to allow access to the flight deck bulkhead wiring for iPad Electronic Flight Bag installation. Akin to peeling back layers of an onion, what seemed simple tasks are actually quite involved. For example, the installation of iPad Electronic Flight Bags in the flight deck required access to the wiring behind the forward galley hence necessitating the removal of the galley. The center fuselage receives a great deal of stress due to the location of the landing gear. Technicians look for defects and repair when necessary. Another, inspection of the centre fuel tank and the centre structure, necessitated the removal of the floorboards and seats from the mid cabin. The bottom line – do the job right the first time. Ms Tuner emphasized, “every time an aircraft is in maintenance…it costs money. Our goal is…to make sure when it goes out, it stays flying for another 18 months without breaking” During the 2018 Fleet Week Air show, United Airlines 777-300ER performed maneuvers seldom seen with an airliner, low over San Francisco landmarks to boot! Ms. Tuner summed it up perfectly, “Aircraft technicians are in the business for one reason and one reason only – the safety of flying – to ensure our aircraft across the world are safe”. 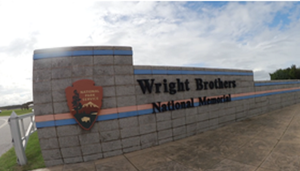 After nearly two years of renovation work and upgrades, the visitor center at the Wright Brothers Memorial National Park, at Kill Devil Hills in North Carolina, will reopen on Saturday. 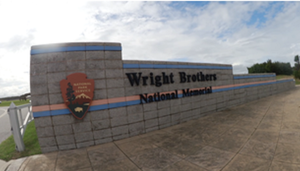 New interactive and educational exhibits tell the Wrights’ story and provide opportunities for children to develop skills in science and engineering. The center’s most popular feature—a meticulous reproduction of the 1903 Wright Flyer built by The Wright Experience—remains the centerpiece of the display. Renovation of the 9,900-square-foot building cost about $5.5 million. Maryland Fleet Week and Air Show Baltimore was on October 3-9, 2018 and celebrated the rich maritime traditions of the Chesapeake Bay and the contributions of Marylanders to the defense of the nation. The USAF Thunderbirds' jets and other aircraft will be on display on the Martin State Airport tarmac and in the skies over Fort McHenry and Middle Branch on October 6 & 7 while U.S., Canadian and British Navy vessels were ready for boarding visitors to the Inner Harbor, Fells Point and Locust Point throughout the week and weekend. Fleet Week Festival, was a free, family-oriented festival throughout Baltimore's Inner Harbor. Catch the wind and join Historic Ships in Baltimore, Sail Baltimore, the City and State along with many partners for the Second Biennial Fleet Week! The Northrop Grumman E-2 Hawkeye is an American all-weather, carrier-capable tactical airborne early warning (AEW) aircraft. This twin-turboprop aircraft was designed and developed during the late 1950s and early 1960s by the Grumman Aircraft Company for the United States Navy as a replacement for the earlier, piston-engined E-1 Tracer, which was rapidly becoming obsolete. The aircraft's performance has been upgraded with the E-2B, and E-2C versions, where most of the changes were made to the radar and radio communications due to advances in electronic integrated circuits and other electronics. The fourth major version of the Hawkeye is the E-2D, which first flew in 2007. The E-2 was the first aircraft designed specifically for its role, as opposed to a modification of an existing airframe, such as the Boeing E-3 Sentry. Variants of the Hawkeye have been in continuous production since 1960, giving it the longest production run of any carrier-based aircraft. The E-2 also received the nickname "Super Fudd" because it replaced the E-1 Tracer "Willy Fudd". In recent decades, the E-2 has been commonly referred to as the "Hummer" because of the distinctive sounds of its turboprop engines, quite unlike that of turbojet and turbofan jet engines. In addition to U.S. Navy service, smaller numbers of E-2s have been sold to the armed forces. Aviation is changing and Uber is leading an effort that will result in a system virtually unrecognizable by today’s standards but not that far away, says the company’s chief of aviation program. Eric Allison, of Uber Elevate, told the opening session at the National Business Aviation Association (NBAA-BACE) convention in Orlando on Tuesday that the next logical step in urban transportation is to take advantage of the “three-dimensional growth” of urban areas. That means using tall buildings and ports to allow the fast and efficient flight of quiet electric VTOL aircraft from landing ports integrated into the buildings. “We’ll have thousands of aircraft in the air doing millions of flights each day,” he said. Allison said the technology and computing power is now in place to make whisking three or four people a few miles across town convenient and safe. Allison said Uber has the number-crunching power to create the aerial networks that he says will transform urban transportation. It will be expensive at first, he admits, but he said he believes the economies of scale will take over and getting around cities via VTOL will be no more expensive than using a car. Los Angeles and Dallas have agreed to take part in the initial studies toward building such systems and Uber is looking for a third test city in another country. TAMPA — An American Airlines flight bound for Charlotte, N.C., was forced to return to Tampa International Airport on Thursday morning after pilots received an error message in the cockpit, according to an American Airlines spokesperson. Shortly after takeoff, around 7 a.m., the airport received an alert that the flight had a mechanical issue and needed to return to the airport, TIA spokesman Danny Valentine said. The flight landed safely at 7:18, he added. According to flight tracking website flightaware.com, the plane made it to skies over Spring Hill before turning around. "Our maintenance team is evaluating the error message that was received in the cockpit, and our team in Tampa is in the process of rebooking passengers on other flights,"
American Airlines spokesman Ross Feinstein said. "We never want to disrupt our customers’ travel plans and we are sorry for the trouble this caused." Ross said the twin-jet Airbus A320 has no record of previous issues. Federal Aviation Administration spokeswoman Kathleen Bergen said the FAA will investigate the incident. SCOTT KEELER | Times An American Airlines jet takes off from Tampa International Airport, Friday, 12/1/17. American Airlines CEO Doug Parker received the 2017 Tony Jannus Award at Tampa International Airport, Friday. He answered questions about the potential American Airlines pilot shortage Christmas week. 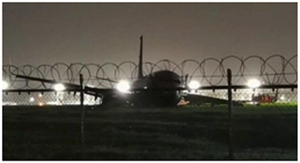 Records show flight 2020 was scheduled to depart Tampa at 6:47 a.m., and land at Charlotte Douglas International Airport around 8:30 a.m.
An Air India Express Boeing 737-800 was diverted to Mumbai Chhtrapati Shivaji International airport after one of its wheels hit the boundary wall of Tiruchirappalli International Airport on 12 October at 01:18 local time. The low-cost carrier tells FlightGlobal the incident happened while the aircraft was taking off. It was operating as flight IX611 from Tiruchirappali to Dubai, carrying 136 passengers and crew members. No one was injured in the incident. While the airline was unable to specify the aircraft's registration, flight tracking sites suggest that the 737 bears the registration VT-AYD, and that it landed in Mumbai at 05:39 local time. Images on social media show a long tear in the fuselage immediately aft of the main landing gear bays. Local media reports indicated that the pilots, who apparently claimed to be unaware of the incident, have since been removed from duty. Twitter/Tarun Shukla: Air India Express adds that investigations are underway, and that the 737 is undergoing repairs at Mumbai airport. Flight Fleets Analyzer shows that VT-AYD was built in 2009, and is owned and managed by Air India Express. Three years ago New York announced redevelopment plans for LaGuardia airport. Getting in and out of LaGuardia has been miserable ever since, and at the end of the process there won’t be more runways, there won’t be more airspace capacity, and there won’t be much better transit to and from the airport. A year and a half ago plans to redevelop New York JFK were introduced and expected to cost $10 billion. That’s already up to $13 billion. We get better road traffic patterns (in some measure reverting to how traffic used to circulate around the airport) but we don’t get… more runways, more airspace capacity, or better transit to and from the airport. New York airport projects are so slow that it takes more than seven years to install runway lights after the funding has already been allocated. All of this attention from top officials is doing a better job driving projects forward but in my view they’re the wrong projects. To be sure JFK is a decrepit physical plant. Here’s a geyser spurting at baggage claim at New York JFK’s terminal 8. 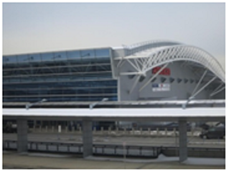 Of course that’s home to American Airlines, one of the newer terminals, and one not slated to be redeveloped in the governor’s $13 billion plan. Unquestionably new terminals will be nicer and more aesthetically pleasing than what we have today, though they won’t do much to improve the actual travel experience — getting to, in and out of the airport quickly. Things like first-class shopping, dining, and business amenities aren’t actually about the passenger experience. Airports need to be easy to get to. They should have security near the entrance [including for better security, as the Brussels and Istanbul airport bombings show the area outside security is a target and you want to get people through security as quickly as possible]. We’d be much better off with airports that efficiently moved people from their initial location to their gate, and on arrival to their final destination, than with sprawling complexes that are cumbersome to traverse but accommodate more retail. Airport restaurants are generally bad anyway. You can only sell off the airport’s future income stream once. Investing the money is new mega-terminals means not investing the money in things that would actually improve the airport most. As a result these choices mean the New York JFK travel experience will be worse than it otherwise could be. The updated brand image and positioning will begin to be reflected across WestJet’s assets including westjet.com, its airport presence across Canada and gradually across the fleet. In addition to the brand refresh, it was revealed WestJet will launch its first three 787 Dreamliner non-stop routes from Calgary to London (Gatwick), Paris and Dublin on 28 April, 17 May and 1 June, 2019, respectively. The first of 10 Boeing 787-9 Dreamliners ordered by WestJet will arrive in Calgary early in 2019, with two more arriving by April. The Chicago-based aerospace giant is investing heavily in a vision that evokes the futuristic world of “The Jetsons,” the 1960s-era cartoon show. Pilotless rotorcraft will eventually ferry people and cargo across clogged urban areas, Muilenburg said. To hasten that goal, the company last year bought drone pioneer Aurora Flight Sciences, which is among the companies vying to develop a flying taxi with Uber Technologies Inc.
For all the noteworthy progress United Airlines had made over the last year, it just takes one bad story to sink the ship. We may have our story…Imagine you are a young mother and step onto a 14-hour flight from Sydney, Australia to San Francisco and find your seat in business class. Your eight-month-old is crying and you do your best to calm him down. But he won’t stop. Naturally, he annoys other passengers who complain to the flight attendant. Now imagine that the flight attendant approaches you and sees you doing everything in your power to soothe your child. But instead of offering a hand or gently asking if she can help, she angrily berates you. She cites the “rule book” in defense of her position that a baby cannot cry for more than five minutes (seriously) and marches you back to economy class to further berate you, insisting that you leave your seat. When asked to produce the rule book, the FA condescendingly laughs and claims she cannot produce it due to the lack of internet…on a flight that has internet. She reminds you that that “many airlines” do not allow children in business class, insinuating that you do not belong there. Signaling to the rest of the cabin, the FA states that fellow passengers have been complaining. Other passengers sheepishly deny this. You re-take your seat in business class ashamed and humiliated. Paying $28 to access internet, you tell your story on Facebook. Sadly, this is a true story. Thankfully, though, our story does not end here. Other FAs came to the aide of the passenger and the captain even came over to apologize. A team of United representatives met the woman and her son at San Francisco with profuse apologies and a full refund of her ticket. Addressing the incident, United has empathically stated that children are welcome in business class: Young families are welcome on our flights, including in business class. We are continuing to review the incident internally and the flight attendant is being held out of service pending the investigation. United handled the aftermath well. Their action was swift and decisive and frankly praiseworthy. But why was that flight attendant so nasty in the first place? Why did she make up those rules? Will there be any consequences for this? I don’t want to turn this into a union-bashing piece, so let’s just assume she won’t lose her job. And perhaps she should not if this is her first incident (kudos to United, though, for pulling her from service). But we see a pattern with the “few bad apples” at United. So often, they’ve been doing the job so long and they are practically unchangeable. Good luck trying to bring about any improvements in behavior. One of the pillars of United’s core4 program is caring. What this FA did is the absolute opposite of caring. The solution is not easy. FAs cannot be suddenly radically transformed, especially through HR programs and memos. I would love to see other factors besides seniority play a role in whether a FA is able to hold a line on a longhaul route, but that is unrealistic. Individual consequences for these types of customer service failures are sadly not likely to ever occur in the U.S. airline industry. Thus, the only path forward I see is if FAs “counsel” fellow FAs. Other FAs—those who get it, those who care—must be the ones to quickly correct their fellow FAs, without fear of reprisal if their seniority is less. Think how other FAs and the captain on this flight diffused the situation. The passenger shares, however, that the offending FA remained rude for the rest of the flight. Some FAs are incorrigible…they are only human. But sometimes we are rude when we don’t mean it. Sometimes we are tone deaf without malice intent. Encouraging FAs to speak up and correct their flying partner might reduce this sort of behavior. It’s worth a shot. I’m glad United has made clear that children are welcome in business class. I’m also glad the passenger was refunded the price of her ticket, which is very generous compensation. But most of all, I’m happy that the captain and other FAs did not succumb to groupthink but stood up for the young mother trying to soothe her crying baby. Sixty years ago, British Airways, then called British Overseas Airways Corporation, became the first airline to fly a turbo jet engine aircraft between Europe and New York, reducing the journey time from 18 hours to around seven. On October 4th, 1958 the airline flew two de Havilland Comet 4 aircraft, one from New York to London and the other from London to New York. One of the original cabin crew members, Peggy Thorne, 91, had joined BOAC in 1950 and was hand-picked to serve customers on the first flight.Today, British Airways hosted Peggy, and captain Hugh Dibley, a former Comet 4 navigator, at an event to celebrate the historic achievement.“It was marvelous,” Peggy remembers. “We were used to travelling to New York on Boeing Stratocruisers which took up to 20 hours. The FAA on Monday issued a new Airworthiness Directive that affects about 1,800 Boeing 737 aircraft operated in the U.S. The AD requires additional inspections of the fan blades in all the airplanes equipped with the same type of blades that caused a catastrophic engine failure in April, when one passenger died on a Southwest flight after a window was broken by engine debris. A previous AD had mandated the inspections after 3,000 flight cycles, but the new AD reduces that interval to 1,600. The AD takes effect on Oct. 16. The updated rule was prompted by continuing research undertaken by CFM, the engine manufacturer. CFM issued a Service Bulletin in July advising operators of the new interval recommendation. The FAA’s AD now makes that new interval mandatory. The FAA estimates each inspection will take about two hours, costing the airlines an average of about $170. If a fan blade fails the inspection, it would cost about $51,000 to replace it. Cart says 60 percent of all battlefield deaths in World War I were caused by artillery, and the Meuse-Argonne Offensive had plenty of it. Howitzers belonging to the 106th Field Artillery are prepared for action during the Meuse-Argonne Offensive. (National WWI Museum and Memorial) “The number of artillery pieces used in this offensive was staggering,” he said. “So it was everywhere.” By early November, the U.S. forces reached their objective and on the 11th, an armistice was signed between the Allies and Germans, ending the war. That day every year has become the American holiday Veterans Day. The Meuse-Argonne Offensive, left 28,000 Germans dead as well, according to the Army Heritage Center. One of the most famous stories to come out of the offensive was the exploits of the “Lost Battalion,” a group of American soldiers who ended up getting surrounded in the Argonne Forest by the Germans. During one rescue attempt of the soldiers, American artillery forces accidentally started shelling their own men. “WE ARE ALONG THE ROAD PARALELL 276.4. OUR ARTILLERY IS DROPPING A BARRAGE DIRECTLY ON US. FOR HEAVENS SAKE STOP IT,” Maj. Charles W. Whittlesey cried out in a message affixed to a carrier pigeon that flew to his compatriots nearby. The troops held their position for five days and nights and eventually were rescued, but ended up losing 107 men, according to statistics from the National Archives. MIAMI — An Alitalia Boeing 777-200(ER), operating flight 621 from Los Angeles (LAX) to Rome-Fiumicino (FCO) had to divert into Salt Lake City (SLC) yesterday because of an unruly passenger. Following the departure from LAX, the plane climbed to its assigned altitude of 35,000ft. As the aircraft continued onwards on its planned route, an unruly passenger forced the flight crew to divert into SLC less than 70 minutes after departing from LAX. As shown by Flightaware, and local Twitter feed, the aircraft had to enter into prolongated holding patterns while fuel was jettisoned. After the aircraft landed, it was met by law enforcement officers, who reportedly removed the unruly passenger to allow the flight to depart back to Rome. According to SLCScanner, the 777 remained on the ground for approximately two hours 30 minutes before departing back to FCO, at 22:24 local time. A flight from LAX to FCO typically lasts approximately 11 hours. This journey, however, lasted more than 15 hours with the unscheduled stop in SLC. It is unclear whether the passenger was charged and fined by the airline. Alitalia currently operates a fleet of 11 Boeing 777-200(ER)s and one 777-300(ER). The airline links Rome-Fiumicino with Los Angeles on a daily basis during summer time. Pilot, mechanic and air traffic controller may be the most high-profile jobs in aviation, but career tracks in engineering and management are also crucial to aviation’s future. This week, Boeing and the National Science Foundation announced a $21 million investment to accelerate training and diversity in those critical areas. "The initiatives will help develop more technical workers and provide research opportunities for women and veterans seeking to join or return to the STEM workforce,” said Heidi Capozzi, a Boeing executive in human resources. NSF will partner with educational institutions to develop online training in critical skill areas for students and Boeing employees, covering topics such as model-based engineering, systems engineering, mechatronics, robotics, data science and sensor analytics, program management and artificial intelligence. The first project is expected to launch next year. Boeing is donating $10 million to the NSF to develop the programs, and the NSF will donate $10 million in scholarship funding. Boeing also will give $1 million to an NSF initiative to increase the number of women and veterans in STEM fields. He goes on to explain that they’re going to keep some 757s in the fleet for five or more years, “We have isolated that fleet of 757s that we think are going to be the ones we can hold onto for the next 5-plus years. We’re going to work those and continue to keep those in the fleet for as long as we can.” Next year American Airlines will take delivery of Airbus A321neos, and those will go to Phoenix because the current A321CO (classic) would be even more restricted flying Hawaii – Phoenix than it is flying Hawaii – Los Angeles. But the A321neo should be able to fly Hawaii – Phoenix without difficulty. Management explains further; American currently takes weight restrictions from Lihue – Los Angeles and on some days Maui – Los Angeles. But the A321neo will have full payload capability out of all Hawaii markets except for Lihue which may take a slight weight restriction. If it can fly, it can evacuate…Boeing Co. flew at least eight of its 787 aircraft out of a South Carolina factory to Seattle on Tuesday ahead of Hurricane Florence, a Category 4 storm expected to strike the Carolinas later this week. The Dreamliners escaped potential damage by flying cross-country to Paine Field, an airport adjacent to Boeing’s Everett, Wash., assembly plant, according to flight tracker Flightradar24.com. The bugout included two 787-9s destined for Hainan Airlines Holding Co. and a 787-10 for United Continental Holdings Inc., the first U.S. customer for the largest model of the wide-body aircraft, which lists for a cool $325.8 million. More 787’s seeking shelter from Hurricane #Florence on their way to Washington, including the first 787-10 for Unit… Boeing suspended operations at its North Charleston, S.C., assembly plant this morning as part of a mandatory evacuation order for coastal areas. The workers who prepared the jets for their trek were among the last to leave, according to a company message to employees. Florence grew larger on Tuesday with 130 mph winds. Landfall is expected late Thursday or early Friday near the North Carolina-South Carolina border. I’m at Everett’s Paine Field with photographer @MattMrozinski watching another @BoeingAirplanes 787 Dreamliner ferryies… The storm comes amid a production bottleneck for Boeing that’s left undelivered 787s stacking up at the plant and in Everett because of supplier issues. The company delivered only eight of the carbon-composite jets in July and August, falling short of its target of 12 per month. SEATTLE (Reuters) - Boeing Co Is Bringing Retired Workers back on the job as the world's largest planemaker tries to fix delays at its 737 jetliner plant outside Seattle, a union official told Reuters on Monday. The snarl at its plant in Renton, Washington, triggered by shortages of engines and fuselages as Boeing sped production to record levels in June, is likely to hurt third-quarter results and threatens its goal to boost build rates again in 2019, some analysts said after meetings in the Seattle area last week. Single-aisle aircraft like the hot-selling 737 and Airbus A320 families are the cash cows of the world's two largest aircraft manufacturers. Investors will get a peek on Tuesday at how far behind Boeing is when it releases its order and delivery tallies for August, a month after deliveries fell to the lowest level in years. Deliveries are crucial to planemakers because that is when airlines pay most of what they owe for the aircraft. Boeing started hiring retired mechanics and inspectors on a temporary basis after reaching an agreement with the International Association of Machinists and Aerospace Workers on Aug. 15, union spokeswoman Connie Kelliher said. Boeing had a similar agreement with the union last autumn following a round of voluntary layoffs, Kelliher said. Boeing spokesman Paul Bergman said the company was dedicating additional resources to the Renton site "to ensure timely deliveries to our customers." Boeing has already deployed about 600 employees and new hires to Renton in recent weeks to help fix delays, analysts said. It was not clear how many retired workers Boeing intends to hire. 2019 SPILLOVER? About 50 semi-finished 737s were scattered around the Renton plant last week, analysts said, several times the number of semi-finished aircraft Reuters reported in July. Boeing largely attributes the snarl to shortages of fuselages from Wichita, Kansas-based Spirit AeroSystems Inc and engines from CFM International Inc, a venture between France's Safran and General Electric Co. "We are working closely with our suppliers Spirit and CFM as they track toward recovery, as well as our customers," Bergman said. "Our team has been mitigating supplier delays, and our factory continues to build 52 airplanes per month." CFM is working to fix delays by year-end, the GE-Safran venture said. Spirit did not immediately respond to a request for comment. (CNN)Passengers from American Airlines Flight 2354 from Los Angeles to Dallas-Fort Worth were bracing for a long night. Their plane was diverted to the regional airport in Wichita Falls, Texas, on Thursday due to severe thunderstorms that impacted the northern part of the state, and 159 frustrated passengers were facing the prospect of being stuck there until morning. Trying to ease their inconvenience, the plane's captain, Jeff Raines, called the local Papa John's and ordered 40 fresh pizzas for delivery at Wichita Falls Municipal Airport (SPS). A video of the act shows the captain running back and forth between the delivery car and the stranded passengers to personally deliver the pizzas. "I don't think I've seen this before," Josh Raines, who works at the airport and shot the video, tweeted. In a message on Facebook, the captain said his entire team participated to help the passengers. "Thanks for the compliments however this was a "TEAM" effort," Raines said. "My First Officer was on the telephone with crew tracking / hotel desk arranging for our release and hotels for the entire crew. The Flight Attendants manned a galley cart from the aircraft serving waters, juice, and sodas to all the passengers in the terminal. All while the Envoy SPS Personnel were arranging for a bus, re-booking flights, and answering a flurry of questions from these passengers. Thanks to everyone for your help - there is no "I" in TEAM." Bloomberg is reporting that Pratt & Whitney has been quietly assessing excessive vibration in its new-design geared turbofan engines in the latest of a string of teething problems with the fuel-sipping design. Bloomberg says a vibration issue has caused cockpit alerts in A320neos that have been delivered to airlines all over the world. Pratt told Bloomberg it’s working on the problem. The FAA has confirmed it’s working with Pratt to identify the cause but it hasn’t issued any orders or bulletins to operators. Bloomberg says its sources estimate that about 10 A320neos are grounded at a time while engineers probe the cause. Like most major technological leaps, the geared turbofan has suffered a series of service entry problems and Pratt is under pressure to get them fixed. The engine uses about 30 percent less fuel than previous generation engines and since fuel is the largest cost for airlines it’s a big attraction. Airbus has kept its chin up through the difficulties, which also affect its newly acquired A220 line of jets that it took over from Bombardier, but there are cracks appearing in that brave face as stock prices dropped more than a full percentage point on the latest news. Airbus says it still plans to deliver 800 A320neos this year. “The risk is that the series of issues with the GTF engine may have begun to test investor’s patience,” Bloomberg reported Jeffries International analyst Sandy Morris as warning clients. U.S. safety regulators are investigating an engine failure on a Delta Air Lines Inc. jet that forced pilots to shut down the turbine and return to Atlanta shortly after takeoff. The accident occurred Wednesday on a Boeing Co. 757-200 bound for Orlando, Florida, the National Transportation Safety Board said Thursday on Twitter. Delta Flight 1418, which had 121 passengers and six crew members, landed safely and there were no injuries. The engine failure occurred at about 18,000 feet, according to the Federal Aviation Administration. The Delta incident is at least the fourth since August 2016 in which an engine failure has allowed debris to escape. The powerplants are designed with a hardened exterior so that even in the event of a blowout, fan blades and other components can’t get out and threaten fuel tanks, passengers and other sensitive aircraft structures. Flight 1418 “experienced a maintenance issue in the right engine shortly after takeoff,” Anthony Black, a Delta spokesman, said in an interview. All maintenance on the engines is performed by Delta’s TechOps unit. The Atlanta-based carrier is cooperating with the NTSB investigation, Black said. “Once they have completed their investigation we will change the engine and the aircraft will be ready to be placed back into service,” he said. Delta isn’t certain how soon that will be. The 27-year-old aircraft had two PW2037 engines made by Pratt & Whitney, a unit of United Technologies Corp. Pratt didn’t immediately respond to a request for comment. The NTSB didn’t provide further details. The agency is also investigating several other cases in which engine failures allowed debris to escape. A woman died in an accident April 17 on a Southwest Airlines Co. flight. The Boeing 737 lost a fan blade, which careened in front of the protective shield and tore off the front of the engine. After debris broke a window, the woman was partially sucked out of the plane. In August 2016, a Southwest Boeing 737-700 had to make an emergency landing in Pensacola, Florida, after a fan blade broke off and debris struck the fuselage, wing and tail, causing the plane to lose cabin pressure. A preliminary NTSB investigation found evidence of a crack “consistent” with metal fatigue in the blade of the CFM56 engine made by CFM International, a joint venture of General Electric Co. and Safran SA. No one was injured. Two months later, an American Airlines Group Inc. flight was accelerating for takeoff at Chicago’s O’Hare airport when the right engine exploded, sending shrapnel through the casing and ignited leaking fuel. One wing of the Boeing 767-300 was engulfed in a fireball as passengers rushed to get off the plane. Twenty people were injured. The GE CF6-80 engine had an apparent manufacturing defect, the NTSB said later, causing a disk to break into at least four pieces. Safety investigators said Thursday that they are looking into a reported engine breakdown on a Delta Air Lines jet shortly after takeoff. The National Transportation Safety Board tweeted that it was investigating a reported "uncontained" engine failure on Wednesday night's Delta Flight 1418 from Atlanta to Orlando, Florida. The NTSB said the crew of the 27-year-old Boeing 757-200 jet with 121 passengers and six Delta employees on board shut down the engine and returned safely to Atlanta. The NTSB said there were no injuries. An uncontained failure occurs when rotating engine parts break off, creating shrapnel that can damage other areas of the plane. A broken fan blade caused an uncontained engine failure on a Southwest Airlines plane that killed a passenger earlier this year. An NTSB spokesman declined to comment about the Delta incident beyond the tweet. Anthony Black, a spokesman for Atlanta-based Delta, issued a statement saying the plane "experienced a maintenance issue." He said Delta was cooperating with the NTSB and will replace the engine when the investigation is over. Jenny Dervin, a spokeswoman for engine manufacturer Pratt & Whitney said the company was participating in the investigation. She declined to comment further. According to data captured by tracking service FlightAware.com, the Delta jet took off shortly after 11 p.m. and climbed to about 18,000 feet in eight minutes before slowing down, leveling off, and then beginning a measured descent back to Hartsfield-Jackson Atlanta International Airport. The plane was in the air for about 28 minutes. Modern airliners are designed — and pilots are trained — to fly safely with one engine. The greatest danger posed by engine failure is that broken pieces can be spit out at high speed, damaging controls, fuel tanks or the fuselage. That is what happened on Southwest Flight 1380 as it cruised 32,000 feet over Pennsylvania on April 17. A woman was fatally injured when she was pushed partly out of a window broken by flying debris. The pilots were able to land in Philadelphia without serious injuries to other passengers. The Southwest engine was made by a different company, a joint venture of General Electric and France's Safran SA. The NTSB plans a hearing on the Southwest case Nov. 14. American Airlines (AA, Dallas/Fort Worth) will retire its fleet of twenty EMB-190s in 2020, Managing Director of Fleet Planning and Analysis, Ryan Travis, has said. According to an internal company letter seen by Airways Magazine, the Embraer Regional Jets will likely be placed with another carrier. The aircraft currently average almost 11 years of age and are all owned and operated by the carrier itself. In the same letter, Travis also stated that American's remaining fleet of McDonnell Douglas twinjets - now down to two MD-82s and thirty-two MD-83s - “are due to retire next year” i.e. 2019. These aircraft could potentially be replaced with second-hand A319-100s. CEO of Denver International Airport (DEN), Kim Day, stated: “We are delighted to welcome our newest airline, Cayman Airways, to DEN, as they provide nonstop service to the Caribbean. This will be a great option for our large Scuba diving population as well as for Coloradoans just looking for a way to explore the Cayman Islands and relax on the beach.” The new Cayman Airways Denver service will operate twice-weekly, on Wednesdays and Saturdays, throughout the peak travel periods of December through August. President Donald Trump has again intervened in the negotiations with Boeing to modify two new 747-8i airliners to serve as the primary Air Force One aircraft and backup but it remains to be seen if the president’s promise of $1 billion in savings will be realized. Defense One reported Trump met with Boeing CEO Dennis Muilenburg at the White House last Tuesday to try to break an impasse between the Air Force, which normally buys its own airplanes, and Boeing. The Air Force wants a fixed-price deal, meaning Boeing would eat any overruns, but Boeing is less keen on the idea. The Air Force already has the aircraft. It bought two 747-8is that were supposed to go to a Russian airline that went bankrupt, so the negotiations are about the many modifications required. Defense One’s sources said the logjam was broken in the White House meeting and details are expected in the next few weeks. Shortly after his election, Trump tweeted that the agreed-to $4 billion deal for the new jets should be canceled because of the cost. Trump later said he’d managed to shave $1 billion off the cost. One of the casualties of the cost-cutting was reported to be air-to-air refueling capability. The rationale for the move was that new 747s can reach just about anywhere on the planet from Washington without a fill-up but refueling is also considered a strategic necessity in case the aircraft needs to stay airborne in a prolonged crisis. It seems like that need is still a factor since the Air Force recently spent $24 million to replace the refrigerators on the current aircraft so they can store the 3,000 meals that are normally loaded to sustain occupants for a long flight. Colombian investigators are recommending that civil aviation authorities conduct an immediate inspection of San Felipe airport to ensure that it complies with safety requirements, after landing accident involving a Douglas DC-3. The inspection should particularly focus on runway maintenance and the removal of foreign objects, says Colombian accident investigation authority GRIAA. Operated by Air Colombia, the DC-3 (HK-3293) had been conducting a visual approach to San Felipe with nine passengers and a crew of three, along with 1.8t of cargo.But as the aircraft landed on runway 18, it gradually pulled to the left. As the crew attempted to correct the DC-3’s track, it veered off the runway 280m after touchdown, listing to the left and causing the wing and propeller to strike the ground. It came to rest, facing north-east, 434m from the threshold, having sustained substantial damage to its left-hand engine, propeller and wing. Examination of the tyre marks on the runway surface showed that the left-hand tyre’s tread was nearly 50% wider than its right-hand counterpart. The investigation also found a 15cm iron rod embedded in the inside wall of the left-hand tyre. Inspection of the runway also found a 13cm iron rod on its surface “located in the path” of the left wheel track of the DC-3. Passengers and crew evacuated the aircraft. Flight Fleets Analyzer lists the Air Colombia DC-3 as a 75-year old airframe. The U.S. Navy has awarded Boeing a contract to configure nine F/A-18E and two F/A-18F Super Hornets for the Blue Angels demonstration team. Since the team’s first performance in 1946, the Blue Angels have used eight aircraft models, including the F11F-1 Tiger, F-4J Phantom II and A-4F Skyhawk II. They have been flying F/A-18C/D Hornets since 1986. The contract for getting the eleven Super Hornets ready for their debut with the Blue Angels, which is worth approximately $17 million, was awarded to Boeing on Monday. Although not specifically stated what changes would be made to the aircraft, conversions on the team's currently flying Hornets included removing the aircraft nose cannons, installing smoke-oil tanks and adding a spring on the sticks. Overall, the Super Hornet is bigger by about four feet in both length and wingspan than the Hornet and heavier by roughly 10,000 pounds. At a maximum speed of Mach 1.6, the Super Hornet is slightly slower than the Hornet’s max of Mach 1.8. According to a Department of Defense release, the Blue Angels Super Hornet conversions will be performed at Boeing’s St. Louis, Missouri, facility. The scheduled completion date for the project is December 2021. After a half-century of experience in the cargo flying sector, long-time pilot Stan DeLong has seen it all. 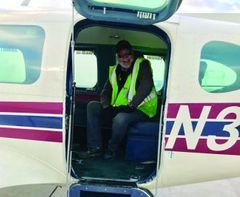 He claims to be semi-retired, but he still flies a Piper Navajo Chieftain during United Parcel Service’s peak season, and is chief pilot and check airman for Gem Air, LLC. If you make the mistake of assuming his experience is geographically limited, he also is check airman for Côte d’Ivoire (formerly the Ivory Coast) in Africa... but that intriguing story will have to wait for another time. Since I am still relatively new to the cargo world, I was determined to meet with DeLong to glean as many insights and as much wisdom as possible. In a world where we learn from experience, the only other thing that comes close is learning from the experiences of others, so I basically had just one overarching question: What makes a safe cargo pilot? His answers were illuminating and applicable to all pilots. Background: Stan Delong’s cargo pilot career started in 1967 in a 1965 Alon A2 Aircoupe with a 90-hp Continental engine. He flew loudspeaker components from Cassville, Wisconsin, across the Mississippi River to Dubuque, Iowa, where they would be loaded onto an Ozark Airlines aircraft for shipment to their destinations. It was only a 20-mile flight, but that beat the convoluted drive required to get the products across the river. Later he flew mail in a Cherokee Six from Dubuque, Iowa, and LaCrosse, Wisconsin, to Minneapolis, Minnesota. This was in the period when cargo operators were just beginning to require instrument ratings, but DeLong was ready with an IFR ticket. The habit of staying a rating or two ahead of increasing requirements remained with him the rest of his career. It’s also a useful tip the rest of us should ponder. Through the 1980s and 1990s, he worked for Ameriflight managing fleets of Beech 99s, Beech 1900s, Fairchild Metroliners and Piper Navajo Chieftains. He had many roles—training pilot, assistant chief pilot, division chief pilot and division manager for the Salt Lake City office—fulfilling major cargo carrier and unscheduled ad hoc deliveries, and ensuring checks, packages and boxes made it to their destinations on time. DeLong’s cargo résumé includes many long routes, like the one from Salt Lake City, Utah, to Great Falls, Montana, but also featured unique, pop-up deliveries. Like getting up in the pre-dawn hours to ensure a helicopter transmission made it to a mining site in Telluride, Colorado, and ensuring a critical insulation blanket was dispatched from Hill AFB to Vandenberg AFB, where it could allow a launch to take place. “A good cargo pilot has to know how to calculate the ways to optimize the route to get the destination on time. And a good cargo pilot also has a backup plan when the destination is a no-go.” But then what? DeLong offered another scenario: “It may be that drivers can meet and unload the aircraft at an intermediate airport, but after the plane is unloaded, does the airport have an IFR departure? Ground deicing equipment if it is snowing? You can choose an alternate airport, but you don’t want to get your aircraft high-centered at an airport you could get into, but then can’t depart.” Every pilot should always have a set of options to stay out of, or deal with, deteriorating conditions. You should know how to calculate the ways to optimize the route to get to the destination safely, even if it isn’t on time, but you also need to be thinking about the next leg and getting the airplane back to base. The plane is important, safety is important and taking care of both requires significant forward thinking. When you fly thousands and thousands of hours, your number will come up for some kind of mechanical failure. The more you fly, the more opportunity you have to experience engines that stop working, vacuum pumps that fail, gear that doesn’t come down or a deicing system that isn’t keeping the airframe clear of ice. When you pay systematic attention, you may be able to troubleshoot or resolve bad things before they are critical. But when you don’t pay systematic attention, bad things get worse. Safe pilots, good pilots, will balance their attention to that 3D spherical envelope outside the plane with a solid understanding and awareness of what is going on with the plane and its systems. There are some pilots that will never get beyond 250 knots. It isn’t personal, it isn’t even skill-based, it’s just a cognitive workload issue,” said Delong. In other words, not every pilot is capable of super-sonic flight or more complexity. The speed factor is how far ahead the pilot's mind can be in 10 minutes. As the saying goes: Never take an airplane anywhere your mind has not visited at least 10 minutes earlier. For a 120-knot pilot, that means visiting 20 miles earlier, 150 knots = 25 miles, 200 knots = 35 miles, and 250 knots = 45 miles. Since the speed limit below 10,000 feet MSL is 250 KIAS, everything above that becomes academic. DeLong told a story of how he trained someone in Côte d’Ivoire to be first officer in a Merlin, but then had to tell the owner to never advance the person to the left seat. “He was good enough for the right seat, but he was not a 250-knot pilot. He was a Mach none pilot.” Despite his advice, the Mach none pilot was eventually promoted to the left seat of a 300-plus-knot aircraft, which he destroyed on a rubber plantation during a hard landing, most likely because he deployed beta thrust well above the runway prior to touchdown. We all want to believe we are capable of flying any aircraft that we are checked out in, but it is equally important to be brutally honest with ourselves and stay safely below the point at which we feel overwhelmed and out of bandwidth. This cargo season, DeLong determined that it was safer for me to stay in a Caravan, a plane I already had 500 hours in. He decided I wasn’t ready for the Navajo Chieftain, a faster twin-engine plane. Can I handle a Chieftain? Probably, but in foul weather, Class Bravo, and less than 20 hours in the airframe, he thought it was smart to wait another year. I gladly deferred to his experience and wisdom. Checking Your Ego: When asked about the biggest dangers, DeLong turned the conversation to the pilots themselves, because the job is ripe for competition. A cargo pilot’s mission—to deliver on time and with the lowest failure rate achievable—is a pressure situation. It comes with permission to be creative, but not to be stupid. A creative pilot is one who might still be able to get to a destination by filing to an alternate airport, shooting the approach to get beneath a layer and access better winds aloft, then flying VFR to the destination. Creative does not mean breaking laws or taking unnecessary chances to hit delivery goals. DeLong said the most dangerous cargo pilot is one who is macho and competitive, someone who turns the pilot lounge into a competitive arena. “Competitiveness in a flight department is toxic. Competitive egos can create a cancer that can quickly spread and ruin the safety culture of a flight department.” His talk about ego made me ponder not flying the Chieftain. Ego tells me to push and strive. Ego wanted me to give the Chieftain a try, which literally meant finishing my check flight and heading into the winter peak cargo season in a plane I was still getting to know. My experience said to listen to those with experience and take slow steps rather than leaping into the fire. Exercising Good Judgement While Retaining PIC Authority: There is a perception that cargo companies have a “Push the pilots out the door” culture, no matter the conditions. It has an element of truth. The pilot is always aware that while he or she is waiting for weather or dispatch, there are folks in trucks at the other end who don’t know exactly what’s going on, much less whether they should keep waiting. One delay may not cause any problems, or it can cascade into multiple delays along the cargo delivery stream, with the inevitable minor or major logistical logjams to solve, and possibly disappointment when a package isn’t delivered on time. While the pilot’s go or no-go decision is critical for the folks downstream, the final authority rests with the pilot in command who owns the risk. It is smart to remember that questions like, “Are you sure you can’t make it here before noon?” are not intended to pressure the pilot into taking unnecessary chances to arrive prior to noon. Noon is likely a logistical breakpoint, a time when the delivery options have to change. For cargo pilots, or any pilot for that matter, it doesn’t matter if the cargo absolutely, positively has to be there overnight—weather issues are given a pass by the customer, and you will not be punished (at least by a good employer) for making a weather call. On the other hand, there is not a lot of forgiveness for showing up to the airport late, getting the wrong fuel load or failing to be prepared for the flight you are about to take. And there is possibly no forgiveness for taking off when you should have stayed on the ground. Time is Money, but Safety Buys Time:The commodity cargo pilots sell is time and delivery. Compared to commercial pilots who haul passengers, a smart cargo pilot has more latitude for shaving off minutes and seconds without impacting safety. The boxes won’t complain if a turn is a bit steep or if the descent rate in a non-pressurized aircraft is uncomfortable. This is not permission to shortcut procedures but creates opportunities to be more efficient. A cargo pilot will be thanked for efficient departures, flight paths that take full advantage of winds aloft and minimal time-wasting on the ground. “Get-there-it is built into the cargo dog’s life. Your employer makes a living off pilots who don’t just get there, but get there on time,” said DeLong. “The key is balancing pressure with good judgment. We all know good judgment comes from experience, and experience comes from bad judgment.” That may be an old cliché, but DeLong has survived 50 years of cargo dog experience. His insights, gathered over a lifetime, apply to all pilots since they face the same risks—cargo pilots simply have more exposure due to the amount of flying they do. Ryanair has announced plans to cut check bag fees by introducing a lower cost check bag service and reduce the volume of free second gate bags which has been causing flight delays, from November 1, 2018 as follows: Priority Boarding customers (currently 30%) can continue to bring 2 free carry-on bags. Non-priority customers can only bring 1 free (small) carry-on bag from 1 Nov. If non-priority customers want to bring a 2nd bigger (wheelie) bag they can buy a lower cost check bag at time of booking. This 10kg (22 lbs.) wheelie bag must be checked in at the airport bag drop desk. – All customers with checked bags can now switch from the €/£25 x20kg bag to the cheaper €/£8 x10kg checked bag. The new policy will go live at boarding gates on/after 1 November 2018 and for all bookings made on/after 1 September 2018. 60% of Ryanair customers will be unaffected by this bag policy change, since 30% of customers already buy Priority Boarding and 30% already travel with only 1 free (small) carry-on bag. Ryanair expects that of the remaining 40% of (non-priority) customers affected by this new policy, most will either switch to priority boarding or will switch to traveling with 1 free (small) carry-on bag only, and others will buy the lower cost 10kg check bag. Photo KTVX Watch: Pilot dies after plane crashes into Utah home with couple inside. Just hours after being arrested and released on bail for allegedly assaulting his wife, a Utah man stole a plane and crashed it into his own home where his wife was staying, police said. The man, 47-year-old Duane Youd, did not survive the crash Monday, officials stated. Flames engulfed the house in the city of Payson after the crash and ensuing fire at 2:30 a.m. Youd's wife as well as a boy were inside the house at the time of the crash. They were lucky they escaped and the plane did not hit other buildings or any power lines, police said. Youd's biological children were not in the home at the time of the crash. Before stealing the plane, Youd called his biological children who were staying in the home where he later crashed and told them to "go stay at their mother's house" that night, which they did, police said.The scene of a plane crash is blocked off as Federal Aviation Administration officials investigate the area in Payson, Utah. Youd was an experienced pilot who had access to the twin engine Cessna 525 jet because he flew for the company that owned it, authorities said. He was the only one in the aircraft when it crashed and killed him. Video taken by a neighbor showed flames coming out of the house and people watching from a distance. The neighbor said his mother heard the plane pass by twice before hearing the crash. In another video taken after the crash, the engines of the jet can be heard continuing to whine and actually seemed to be revving up, even as the house goes up in flames.The crash was the third incident with Youd that required authorities within a 12-hour period. At 7:30 p.m., the night before, Youd had been arrested for assaulting his wife and was released on bail, police said. In this frame from video, emergency personnel work at the scene of a small plane that crashed into a house in Payson, Utah. Hours later, at 12:30 a.m., Youd called and asked a patrol officer be present at his house to "keep the peace" as he picked up belongings and his truck, officials said. There was no argument during this incident. The plane crash took place just two hours later. Police said Youd had also been arrested for domestic violence at the house in a previous incident within the past year. Federal Aviation Administration officials investigate the scene of a plane crash in Payson, Utah, Aug. 13, 2018. The National Transportation Safety Board will be at the scene later today to investigate, officials said. MIAMI — A Cathay Pacific Boeing 777-300(ER) was damaged yesterday at Rome–Fiumicino Airport as it pushed back for its flight back to Hong Kong. The aircraft’s right wing hit one of the airport’s floodlight poles, causing severe damage to the raked wingtip. The aircraft involved is B-KPY, a 6-year-old Triple Seven, which was delivered to the airline back in January 2012. Photos show parts of the aircraft’s wing on the ground. Rome Aviation Spotters managed to capture the incident, showing the rear section of the raked wingtip partially wrapping the airport’s pole. The airline confirmed that the aircraft “was involved in a towing incident in which one of its wingtips struck a standing pole.” “The incident occurred when the Boeing 777-300ER aircraft was being towed by a truck operated by a local ground handling agent at the airport,” a Cathay Pacific spokeswoman stated. This is one of Cathay Pacific’s re-configured 777s, which has been fitted with more seats in Economy Class. The airline has adopted the industry-wide 10-abreast seating configuration, fitting 368 passengers in Economy Class. Cathay Pacific announced in February this year that it would increase its Hong Kong – Rome service to a daily flight on its higher-capacity 777-300(ER)s during the summer season. For the winter season, however, the schedule drops to four-times per week with the airline’s new Airbus A350-900. MIAMI — A Xiamen Airlines Boeing 737-800 has skidded off the runway at Manila-Ninoy Aquino International Airport in the Philippines. The aircraft’s left engine was detached from the wing following the troubled landing. Local news report that a strong thunderstorm passed through the airport at the time of the incident. The Philippines has experienced terrible floodings over the last week. Aviation-Safety.net tells that Flight MF8667 had descended to 18,000ft towards Manila, then entering a holding pattern to the north-east of the airport for about 14 minutes before positioning for an approach to Runway 24. “The approach was aborted at 23:40 and the aircraft position for another approach,” the report says. “The aircraft touched down at 23:55 but went off the runway. At the time of the accident, a thunderstorm was passing the airport.” A Weibo user uploaded a video showing the moment when the aircraft vacated the runway at high speed. Following the incident, Manila Tower’s controller called numerous times ‘Xiamen Air 8667,’ getting no responses from the troubled aircraft. The controller then asked the following traffic to go-around. With no fatalities reported, the aircraft is resting at the end of Runway 24. Preliminary reports list a few passengers with injuries. It’s been over a year since Alitalia’s bankruptcy and nothing’s been done to sell off the airline. Italy is in a precarious political situation with a right wing left wing coalition that looks as if it’s unlikely to survive 12 months. With Lufthansa, easyJet, Cerberus Capital and Wizz Air all after all or parts of Alitalia, on August 3rd the new Transport Minister Danilo Tonenelli, decided none of the tabled offers were suitable. The bizarre politics of a left-right coalition has set a series of very different priorities but both agree that 51% of the Airline remains government owned – but not government run. Quite how this will resolve itself for the airline, which is carrying on as though nothing has happened, leaves them in a vacuum. In fact it’s business figures are markedly improved and it’s going through what industrial psychology has suggested is “Chapter 11 syndrome”. This is where employers and employees suddenly subconsciously respond to a challenged situation, that may make or break them. They tend to pull together and work better. Sadly the syndrome dissipates quickly once companies come out of Chapter 11 and relax without the goal to escape it. So, for those interested in buying the airline – they have as much of an idea as to what happens next, as you or I do. Italy is now on vacation for a month – nothing new is likely to emerge before October. Carry-On Bag Catches Fire At The Savannah Airport. When a carry-on bag started smoking last month at the Savannah-Hilton Head International Airport, quick action by a Transportation Security Administration officer kept passengers and screening equipment safe, a news release said. 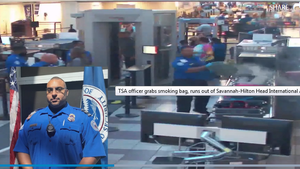 Mark Howell, regional spokesman for the TSA, said on Thursday that a passenger at the security checkpoint July 20 called attention to the smoking bag. The carry-on bag had been scanned and was waiting to be searched at the security checkpoint, he said. Darrell Wade, a lead TSA officer, grabbed the bag and got it safely outside the terminal, according to the news release from the TSA. Law enforcement officers were called and determined the bag contained a malfunctioning vape battery, the news release said.“The battery caught fire, and the bag started smoking real quick,” Howell said, explaining that the heat melted a hole in the bottom of the bag. The news release said that the checkpoint was able to remain open, and no one was injured. Battery-powered e-cigarettes, vape pens and other such devices are allowed in carry-on bags but not checked luggage, the news release reminded flyers. The devices should be taken out of bags that are checked at the gate. Question: Is Norwegian responsible for paying the expenses the Ferrises incurred while they waited for the luggage? I’ve looked at Norwegian’s contract with its passengers, the international rules on delayed baggage, and the e-mail exchange between Ferris and Norwegian over who bears the cost. About half of the Ferrises’ claim is for two nights at a Sheraton hotel at the airport. That’s a lot of money. I think I would have insisted on something in writing from Norwegian before checking in, but the Ferrises did not do so. Still, I think the airline owes something more than an apology and nominal amount to the couple. It comes down to reasonable conduct, and I think the Ferrises understandably worried about the difficulty of getting the missing piece of luggage to them once they left Charles de Gaulle airport. It would have been different if the Ferrises had been planning to stay in Paris. When my wife and I traveled to Barcelona two years ago, our luggage was lost. But we were staying in the heart of the city. And early the next morning, a cheerful driver delivered the goods. No harm, no foul. (My wife had wisely stashed spare toothbrushes and other essentials in our carry-on bags.) But Paris was never on the Ferrises’ itinerary. They were heading to the countryside and planned to keep moving from one place to another every couple of days. Could the Ferrises really count on Norwegian to hit a moving target by dispatching a driver over rural roads? Sure, Norwegian says. “It would take some time, of course, but we have contracts with a number of delivery firms for this and do this on a regular basis,” said Anders Lindstrom, a Norwegian spokesman. Lindstrom also said the airline could find no employee at the airport who acknowledged telling the Ferrises to wait at the airport for bags. “Norwegian’s ground handler would/should not ask a customer to stay at the airport,” he said. The airline’s policy, he said, is to encourage travelers to move forward with their travel plans even without their luggage. © Jonathan Wiggs/Globe Staff Neil and Maureen Ferris sought to be reimbursed about $1,500 by Norwegian Air. They were offered $54. “I really expected them to reimburse me,” Neil Ferris said. “It feels like a case of mistreatment.” Disputes like this are one reason travelers should document everything. Of course, when you are in the moment, the stress can cloud your usual impulse to write it down. The Ferrises’ failure to keep records is understandable: The couple at first thought they faced only a short-term delay, only to have the crisis drag on for two days. Neil Ferris, 72, is a retired high tech business executive who has traveled extensively. He said he loves Norwegian, which has made a name for itself by offering low prices, and praises the airline for taking good care of him after a flight got canceled at the last minute recently in Ireland. But Ferris said he wants to get the word out to other travelers to be wary in such circumstances. Norwegian said it would give the couple $54 — the maximum allowable reimbursement of $47 for toiletries, plus $7 for two T-shirts Neil Ferris purchased. “To ensure all passengers are treated equally, all airlines follow common rules when handling delayed baggage claims,” the airline wrote. “Our liability is limited in line with these international regulations.” That suggests that all airlines are severely limited in how much they can reimburse passengers, right? Not so. The international agreement among airlines imposes a limitation of about $1,600. It says airlines are liable for expenses incurred due to delayed baggage. It does, however, say airlines aren’t liable when they can prove they “took all measures that could reasonably be required to avoid” losing baggage and causing delay. Well, c’mon. Norwegian failed to get Neil Ferris’s suitcase on the plane with him. The airline failed at one of its core functions. There’s nothing reasonable about that. Norwegian, make a better offer than $54. Washington: There are days when paperwork weighs you down - and there are days when you are weighed down by so much paperwork your flight can't take off. Monday was such a day, when American Airlines Flight 163 bound for Los Angeles found itself literally grounded by 635 kg of what the pilot termed "government documents." The excess weight had to be unloaded before the flight could take off from Reagan National Airport in suburban Arlington, Virginia. It seemed fitting for Washington, a town where documents - shredded or not - figure prominently in the daily narrative. Robert Hernandez, an associate professor of professional practice at the University of Southern California, couldn't help but chuckle when he heard the announcement."Sooooo... my flight is delayed because it has too much weight. The pilot announced that they are now going to unload 1,400 lbs of FEDERAL PAPERWORK. wut" - Robert Hernandez @webjournalist 6 Aug "I don't know if the pilot was kidding or not, but we were overweight," he said. Hernandez, in town for an academic journalism conference, joked that perhaps it had something to do with the Robert Mueller investigation, which has amassed more than a million pages of documents since it began last year, according to some reports. Matt Miller, an American Airlines spokesman, confirmed that a flight was delayed about 30 minutes and that the airline removed 635 kg of cargo. As to whether all that weight was federal paperwork, he's not certain. The captain's comment, he said, may have been in jest. American Airlines has a contract with the US Postal Service to transport mail, he said, so some of that weight could have been overstuffed flat rate boxes and birthday cards bound for the West Coast. Miller said the cause was a weather-related weight restriction - there were storms followed by intense heat on Monday - and that meant the crew had to lighten up the plane. As was shown during last year's heat wave in Arizona, when American was forced to cancel dozens of flights in and out of Phoenix, air is less dense when it's hot, which can affect an aircraft's ability to get off the ground. Other than the paperwork problem, Hernandez said, the flight was uneventful, but the memory still makes him laugh. Smith’s group is hosting a free pilot career forum at DFW Airport Saturday to introduce potential pilots to the profession and the steps it takes to make it into the cockpit. It’s a career Smith said that can yield $10 million dollars in lifetime earnings and benefits at a major airline, with a job description that's unlike any other. But getting there means investing hundreds of thousands of dollars, thousands of hours of training and years working up the airline food chain. “We always tell future pilots to avoid becoming a pilot if it’s specifically for the money or if you want to work a 9 to 5 job,” Smith said. “Airlines never close. The time away from home can be very stressful on families. You get sick of those little bars of soap. You need a passion for flying to enjoy the cockpit profession.” Southwest Airlines captain Kyle McDaniel arrives for work at Dallas Love Field, Wednesday, December 6, 2017. The report also declines to suggest the crew was to blame, noting there was “no evidence” that either the pilot-in-command or the first officer had “experienced recent changes or difficulties in personal relationships or that there were any conflicts or problems between them.” Communications with ATC prior to the disappearance were routine, and no evidence of anxiety or stress was detected. “There had been no financial stress or impending insolvency, recent or additional insurance coverage purchased or recent behavioral changes for the crew,” according to the report. The leader of the investigation, Kok Soo Chon, said at a news conference, “We are not of the opinion that it could be an event committed by the pilot.” Kok also said the report is not considered final, since it was not possible to examine the wreckage or flight recorders. Re-enactments of the final flight, undertaken in a simulator using the available flight data, established that the aircraft’s turn off course was “likely made while the aircraft was under manual control and not the autopilot.” It could not be established whether the aircraft was flown by anyone other than the pilots. The report noted that air traffic controllers who were monitoring the flight didn’t follow procedures and failed to watch radar displays as required. They also delayed activating emergency processes, which delayed the start of search-and-rescue operations. The investigative team included experts from the U.S., China and Australia. Kok said the report is not considered final, since it was not possible to examine the wreckage or flight recorders. Malaysia’s transport minister, Anthony Loke Siew Fook, said the government would review the safety recommendations in the report and take steps to prevent similar future air accidents, according to The Wall Street Journal. The government will also conduct a “thorough investigation” and punish those found guilty of any misconduct, he said. Tens of thousands of pilots for United Airlines, Southwest Airlines and American Airlines and nearly 50 other commercial airlines raised their collective voices today and said “no way” to a bill now before the U.S. Congress with a provision in it authorizing the Federal Aviation Administration to launch a research and development program for single pilot all-cargo flights. The operative phrase there is “single pilot,” an operating option that has sent a collective chill down the spines of commercial airline pilots who fear that if cargo flights are allowed to operate with just one pilot in the cockpit, commercial passenger flights could be next. The bill before Congress states that remote-piloting or computer-piloting technology would be used in conjunction with the single pilot in the cockpit manning the plane.But pilots say such an approach to flying a commercial aircraft doesn’t take into account everything that happens in a cockpit, including interacting with air traffic control, communicating with dispatch, checking weather conditions, visually scanning for other aircraft, and monitoring engines and fuel, among other responsibilities. It is likely the flying days of an Atlas Air Boeing 767 are over after “hard landing” at Portsmouth Airport in New Hampshire on Friday. The old airliner, filled with troops returning home, hit the ground hard enough for the fuselage to buckle and leave a crease in the skin. There were also reports that the collision with earth ripped fixtures from the ceiling inside the cabin. There were no reported injuries among the troops. The number of passengers aboard wasn’t immediately released but the aircraft, a 300 model, can carry up to 351 people in all economy configuration and the troop flights normally fly full. As of Sunday, accident websites were reporting the aircraft was still on the ground in Portsmouth. The sites are reporting that an inspection revealed serious damage to the aircraft. Investigators from Mexico’s civil aviation authority have recovered the flight recorders from the Aeroméxico aircraft that crashed on takeoff from Durango airport on Tuesday. Flight AM2431 was on a domestic flight to Mexico City when it came down shortly after takeoff in Durango in what has been reported as poor weather. All 103 passengers and crew evacuated the aircraft, with most sustaining only minor injuries. Mexico’s Secretary of Transport Gerardo Ruiz Esparza said in a tweet that of the injured, only four people remain in a serious but stable condition. Aeroméxico said there were 88 adult passengers, nine minors, two infants, two pilots and two flight attendants on the flight to Mexico City. Many of the passengers are US citizens, with American consular officials in Mexico providing assistance. The airline said a dedicated team in Durango continues to provide help to passengers and their families. Aeroméxico chief executive Andrés Conesa said the company has allocated all available resources to dealing with the accident. “Our priority is attending to passengers and their families. We’ve aligned all our efforts to taking care of their needs the best we can at this time.” The airline said the actions taken by the crew during the evacuation of the aircraft were critical in avoiding loss of life. “We’d like to extend our deepest thanks to all who responded to the accident and have provided care to those affected, their professionalism and support have helped immeasurably.” Mexico’s Directorate General of Civil Aviation (DGAC) is leading the investigation with help from Brazil and the United States. The Embraer E190 was made in Brazil and its engines supplied by General Electric of the US.